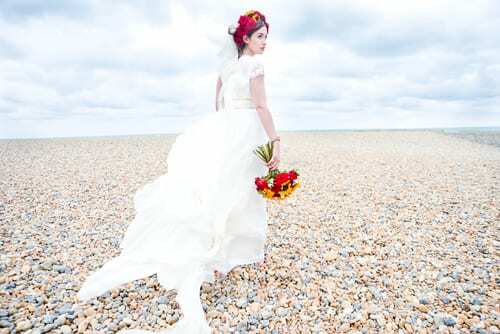 It’s Wedding Wednesday and this week, I’m delighted to share with you photos from a romantic beach styled wedding shoot. I love the flower crown! 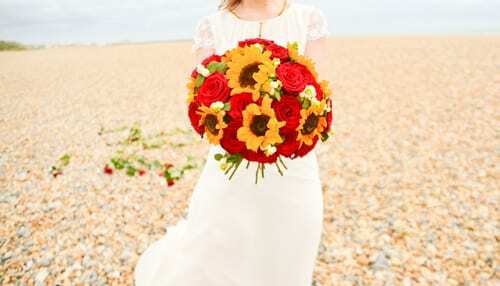 And the way that the deep red roses contrast so beautifully with the yellow sunflowers…a colour combination that is so effective. The gorgeous floral designs were created by Emma Soulsby from Ladybird. Emma and I met ‘virtually’ after she attended a course at the Tallulah Rose Flower School in Bath, which I regularly visit to train the students on social media. 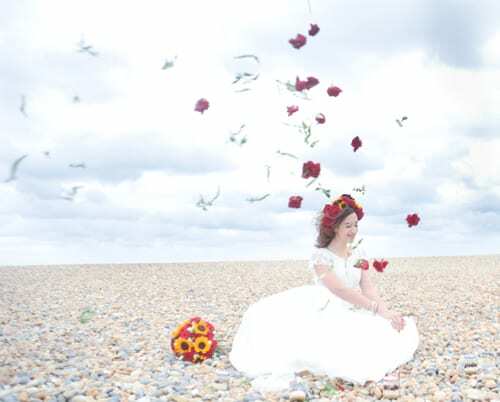 I asked Emma to give us a bit of background about her floristry career and the shoot itself. She said: ‘I’ve always been passionate about flowers and I love how much joy they can bring. About a year ago, I decided to explore the flower world a little further and started to spend my weekends volunteering at my local florist. I thoroughly enjoyed it and soon realised that I needed to make my dream into a reality. After about six months volunteering, I started taking orders under my own Ladybird brand and now regularly visit New Covent Garden Flower Market. I fell in love with the place, which still fills me full of joy and happiness…the perfect way to start my day. I took a course at the Tallulah Rose Flower School, run by Rachel. She’s definitely part of the foundation of Ladybird, giving me the confidence and inspiration to allow myself and Ladybird to grow. I would highly recommend her and I’m very happy that we remain in contact. And she’s always full of support and encouragement. I love creating anything with flowers, ranging from small delicate hand-tieds to large luscious bouquets, and private intimate parties to elegant corporate events. The wedding shoot came to my attention via Facebook. 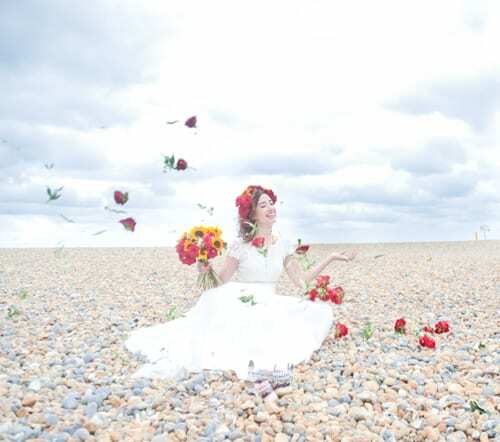 I’m a member of The London Wedding Group and replied to a post by Jane Mires who was seeking volunteers to help create a romantic beach styled wedding shoot. I offered to create the flowers and after meeting Jane to ensure I’d understood her brief, I couldn’t wait to get started. I decided to work with bright and striking bold colours, perfectly romantic. I knew the model had dark hair. So the red from the roses and yellow from the sunflowers would work perfectly. I had so much fun working on this shoot and with the team who were all amazingly talented and professional. Thank you very much to Emma for sending me these beautiful images. If you’d like to keep up-to-date with her news, she’s on Twitter.